“Go therefore and make disciples of all the nations” (Mat 28:19) holds a direct challenge for BFF. Since 2004 the Lord has been sending Paul overseas at least twice a year to provide pastor training seminars and to have resources translated for the nations. The first step is to create quality Christian training resources in English. God has graciously aided us with that. The second step, to create resources in other languages is costly and difficult. God, however, has accomplished this very thing over the years with very little financial and human input. For example, Paul traveled to Burma (Myanmar), India and Taiwan this year. 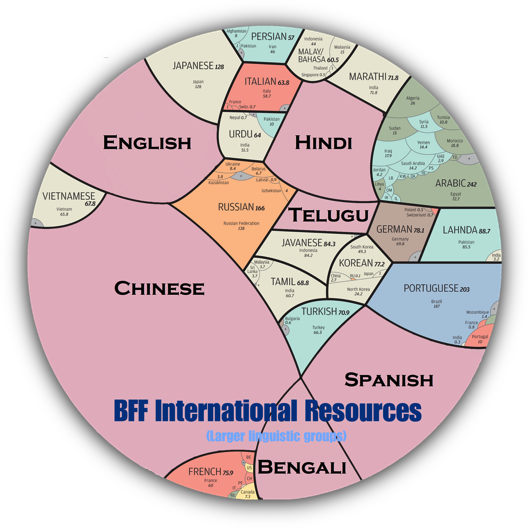 The graphic on the upper right highlights the largest language groups around the world where BFF has Christian training resources (pink areas - see original). BFF has more Christian training resources in minor languages but that is another letter. It is encouraging to note that on the last trip to India, BFF gained about 30 new Christian life audio/videos translated into Hindi. Remarkably, The Life Core has been translated into Hindi. There is still much work to do to get the many pages or Hindi resources into searchable web pages and to get it into print (now only in pdf). But with 7.2 trillion people now in the world, BFF has a long way to go. You can notice how many large linguistic groups we have not even begun to scratch the surface of. All need good Christian training resources. Pray that God would open doors to other larger nations–like Brazil, Japan, Indonesia, Russia, etc. Also, I have been working with Chinese 35+ years and have a burden that more of our resources would be translated into Chinese. Pray with us that God would open doors, for Satan stands opposed to these very things. God has been giving much grace for our Sunday Training class on Revelation. They have proven to be the most difficult studies I have ever done. Thank Him for strength and wisdom. Ten+ lesson rough handouts are completed for the upcoming course on the Holy Spirit. About 6 left to go. 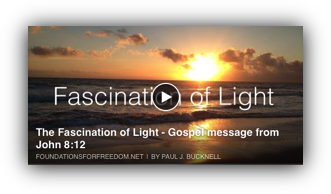 The Gospel message on John 8:12, Fascination with Light, to Indian students last Saturday went well, but a conflict of schedules reduced the number of Indians present to about 25. Thank the Lord for increased BFF donations and some help with our children in college! A box of paperbacks of The Bible Teaching Commentary on Romans arrived yesterday! Our family is healthy and doing well. Very thankful that I have been able to add numerous articles over the last several weeks, as well as create many new web pages and upgrade our BFF Facebook page (Been there lately?). Preaching Sunday (Nov 1) on the “The Fight for Faithfulness” from the church at Pergamum (Rev 2). This study has been so difficult and deep, being totally oblivious to the many historical and biblical resources on Pergamum and the martyr Antipas. May God open doors to reach an increased number of larger nations with BFF teaching resources. Pray for guidance on where to go for the next short term missions for the next two years. The studies and teaching lessons for the last chapters of Revelation continue to the last day of December! Rightfully dividing each lesson holds enormous challenges for our teaching team. Paul is developing and leading Bible studies for our married family small group. Although the old website is on the new server, we have the huge challenge of developing a new web design and then transferring the thousands of web pages.